I made him a Barney cake. Please excuse the terrible photo. I was just about to cut it after the candles were removed and realised I hadn't taken a picture so quickly snapped this one! Watching Daddy light the candles. Not sure how to blow out the candles. But it was very exciting watching the flames! Aaron helped blow them out. Enjoying the ice-cream we served with the cake. Fancy him being 2 already! And soon Maddison will be 5 and Aaron will be 7! Time surely does fly by doesn't it. wow it's scary how time flies, 2 so soon lol. Love the cake you made Rachel. I am in awe of your birthday cake skills. Looks like Master S had a fab celebration. When in June do you head back to NZ? BTW thansk for replying about the school system there. Very interesting and yes I can see why you chose the schools that you go too now. How r you? I all ways love cheeking out you blog as it is so interesting. Ur kids have grown heaps since I saw you last I dont think I have even met Samuel. We should Catch up some time when you r in NZ. When r u coming to NZ? I am still making Cards but not as much now as I use to as I am very busy with school and study. man, time just goes so fast eh? Happy birthday to S! Barney is looking delicious - probably the only way I'd like him - ha ha!! Love the new blog look:) Happy Birthday Samuel! wow, 2 already! gosh time does fly! 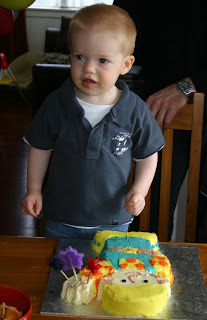 That barney cake is nearly as big as he is! He's TWO - where did the time go?! Seriously! I love the cake, great job! And what gorgeous photos, he looks like he had a fun party! well that time has certainly flown by - the young fella is 2 ... wowser! Fabulous baking skills ... nothing wrong with your Barney cake - very flash.